This is one of Bradbury’s I have yet to read. I do like it when older books have at least parts that feel very relevant for today. I remember being really surprised at how relevant I felt Dune was when reading it for the first time a few years ago. Sadly obsession with nuclear war may be on the rise given what is going on with Iran. I agree with you, Bradbury can turn a phrase. It’s amazing how much Bradbury there is that I haven’t even looked into. Like, he’s such a familiar writer, I think I’ve read loads of his stuff — but I really haven’t. It is interesting when themes keep on resonating, and I agree: I think that nuclear war theme in this book may become relevant again, and maybe more so in countries that have a direct stake in what’s going on there. I know, I feel the same way about how much stuff I haven’t gotten to. I haven’t read Fahrenheit 451, for example. My favorite of his thus far is Dandelion Wine and I’ve read several of his short stories. I also remember reading Something Wicked This Way Comes when I was a kid. *Fahrenheit 451 *was the first I read, I think, and then *The Illustrated Man*. I still need to get round to *Dandelion Wine*! I feel like *Fahrenheit 451 *maybe gets a liiiittle too much attention because of the massive interest people have in dystopias. I’ve enjoyed other books by Bradbury more. Mars colonizes the colonizers…oh, I’m going to have to keep thinking about that phrase. Such an interesting insight! 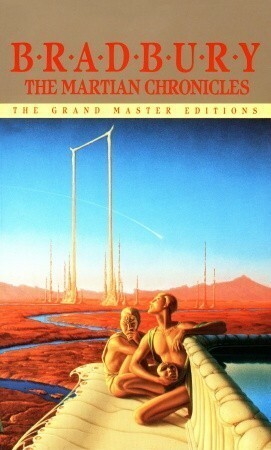 I remember catching the last episode of The Martian Chronicles starring Rock Hudson on TV around 1980 when, shorn of context, it irritated me for its unscientific depiction of Mars (humans breathing its atmosphere for a start) and was never tempted to read it. I may possibly bother now, even through I’m struggling through Something wicked this way comes. Enjoyed Fahrenheit 451 so much more. Yes, I too liked the phrase about Mars colonising the colonisers — good title for the essay! I think Bradbury does briefly touch on the atmosphere of Mars, but not really in such a way that explains that issue… Some parts of it are interesting, anyway, and Bradbury really could write — I think I would recommend it if you’re interested in reading more Bradbury. Thanks, I will, especially as I now see the TV mini-series (as we now call a serial of more than one episode) was generally panned at the time. A classic, yet I’ve never read it. This is another one I must read. I’m currently reading a Mars colony novel, Red Mars, and I’m even writing a book that takes place mostly on Mars. This should be interesting. You could make a whole theme of reading books about colonising Mars, I think! Definitely. There are many books written about it!